Technology Innovation is the lifeblood of every company trying to complete in today’s market. Micro Focus is pleased to announce that Cognizant was awarded an ADM Technology Innovator Award at the recent Micro Focus Universe 2019 held in Vienna, Austria. 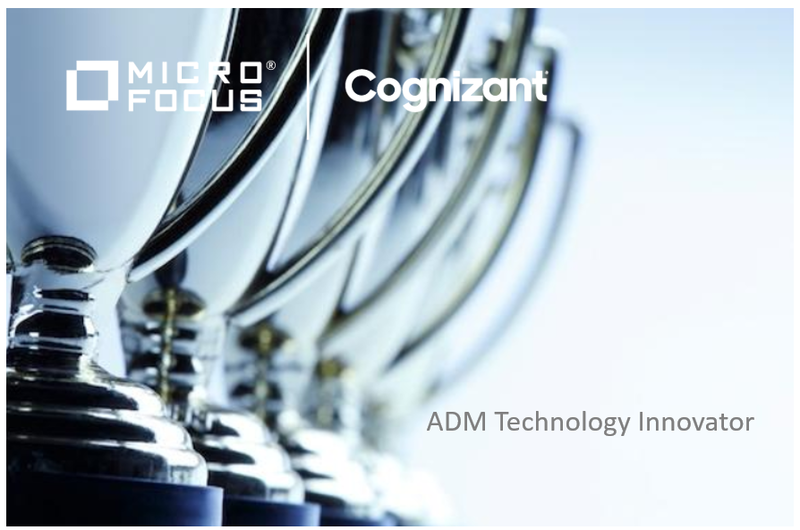 Cognizant received this ADM Technology Innovator Award for their close engagement with the Micro Focus Application Delivery Management (ADM) R&D team and their collaborative work around QI Bots. As a Micro Focus Alliance Partner, Cognizant is one of the world’s leading professional services companies, transforming clients’ business, operating and technology models for the digital era. Cognizant’s unique industry-based, consultative approach helps many of the best-known organizations in every industry and geography envision, build and run more innovative and efficient businesses. Founded in 1994 as a technology development arm of The Dun & Bradstreet Corporation, Cognizant was spun off as an independent company in 1996, and has worked closely with large organizations to help them build stronger businesses ever since. Today, Cognizant specializes in helping some of the world’s most established companies to stay the most loved brands in today’s fast-changing technology landscape by advancing every aspect of how they serve their customers: digitizing their products, services and customer experiences; automating their business processes; and modernizing their technology infrastructures. Cognizant is a GOLD SPONSOR of the Micro Focus ADM Summit being held in Rosemont, IL next week. Please stop by their booth and congratulate them on this well-deserved award! Register here to attend and find more out about the Micro Focus Cognizant partnership right here.